6th edition of Carpathian Couriers Race starts in less than a 2 weeks. 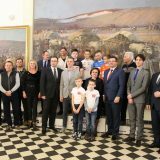 List of participants and the route have been announced and organizers from four countries are working hard to prepare the event for nearly 200 young riders. Today we talked to Christophe Brandt, directeur sportif of continental team Color Code Biowanze. Wallonian squad participates in the race every year and riders in grey jerseys always show a lot of dedication and panache, winning stages and animating racing whenever they can. Last year, it was Boris Vallee, who claimed the victory in the prologue, adding one more victory to his rich palmares and a couple months later securing a professional contract with ProTour team Lotto-Belisol. Once a professional himself, Brandt knows how to encourage his riders and what tips may help during a week of racing. During his career, he raced for Lotto, performing well in stage races, taking 14th in 2004 Giro d’Italia and finishing 35th in 2002 Tour de France. Today, he works with young riders and helps talented juniors make their first steps in U-23 category. Christophe, you are coming to the race with your team Color Code Biowanze every year. How do you like the event? I like it, we are coming there because of hospitality, good quality of the race organization and the route. Do you think it’s similar to races your riders participate in back in Belgium, Netherlands or France? Is it different in any significant way? We can’t find stage profiles in Belgium and the Netherlands. Sometimes it’s possible in France. We have to participate in this kind of races for our riders who like climbing. The quality of the bunch is also important – we race there against the future professional riders. You were a rider yourself and you talk with riders as a DS. How is the race perceived by them in general? What do they think the level of racing? I was always motivated by stage races with this kind of parcours, so I try to motivate my riders in the same way, especially that we have good results every year. Also, I have some riders on the team who can do well in your race. The level is really good and it’s improving every year. There are not many under-23 stage races in Europe and it’s important for a young rider to learn his capacity after 4-5 day effort. This year we have 6 stages, including a long time trial. Do you set any particular goals before the race? What are you hoping for? A long time trial is always decisive, so we will first try to win a stage and to put our time trial specialist in the best position until this. And then, if it’s possible, try to win the overall. 6 days is long time but we start every race hoping for at least one stage win.